If you have used your Instagram account over the last few years, you will have noticed some changes. Some of them, like Instagram Chat, IGTV, and the ability to add music to your Stories are clearly to everybody's benefit. However, changes to the core Instagram algorithm mean that Instagram plays differently now. This has led to clear winners and just as many losers. What is particularly challenging for firms who have learned how to market on Instagram is that the new Instagram algorithm means that it is much harder to position your message for potential customers to see. Indeed you need to rethink the type of messages you post to Instagram. Does Having a Business Profile Reduce Your Chances of Being Seen? The Instagram algorithm is the intelligent programming that decides the order of posts that Instagram presents in any user’s feed. In the old days (pre-2016), all posts were delivered in sequence, with your newest posts showing at the top of your feed. As Instagram grew more popular, this became unwieldy. The average Instagrammer received far too many posts for them to see everything. This meant that quite a few posts, potentially from people they most cared about, were never viewed, merely because they were too far down the queue. Instagram has changed its algorithm a couple of times over the last few years. It moved from its purely chronological feed in 2016, with an effort to best-guess the preferences of each of its users. It now creates a personalized feed for each Instagrammer, with an emphasis on posts it believes are from friends and family. This means that if you are a marketer, you may find it very difficult to push posts that people will see. Your posts will always be shunted back by posts that Instagram’s algorithm thinks are more suitable for a particular Instagrammer. Instagram announced another change to its algorithm on March 22nd this year. This brought Instagram more into line with its parent company, Facebook’s own algorithm. They claim that Instagram users had been pleading for this change for years. The new Instagram algorithm displays photos and videos in a more chronological order than it was after the 2016 changes. They also trialed a “New Posts” button to give users better control over refreshing their feeds, but this didn’t make it into the final update. Back in the days when there was a straight chronological feed you didn't really have to worry too much about your posts. You just tried to post when your audience was most active. With the intelligent Instagram algorithm, however, many factors now affect how easily people will find your posts in their feeds. The initial 2016 changes profoundly affected business posting. Many firms found that their posts received up to 33% less engagement than previously. The most recent Instagram algorithm changes have partially reversed the 2016 modifications. There is once again more of a chronological feel to any user’s feed. The new algorithm gives more weight to newer posts rather than older ones. This doesn’t mean a return to the chronological feed though. It just stops very old content being bumped up people’s feeds. There is a range of factors that affect the order of an Instagram feed, alongside the freshness of any individual post. 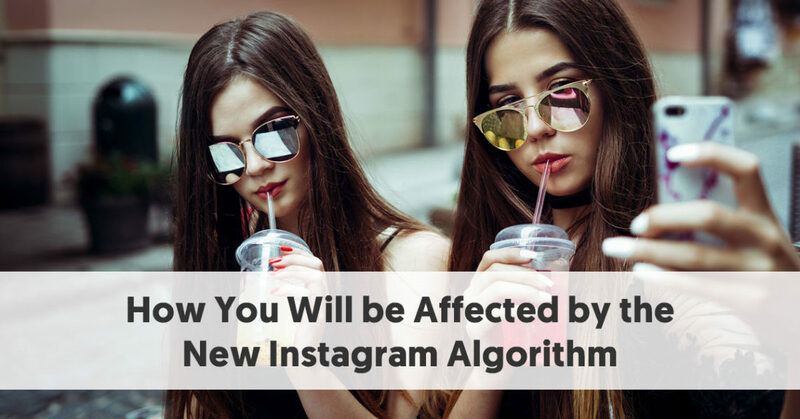 Many of the features we previously looked at in How to Beat the Instagram Algorithm Without Actually Cheating still apply to the latest algorithm. Here are some of the critical factors that affect the likelihood of a particular post appearing near the top of any individual Instagrammer’s newsfeed. The higher the engagement a post receives, the higher the likelihood that Instagram will boost it to the top of somebody’s feed. But it is more than that. If you have a history of making posts with high engagement, Instagram will give all of your posts a nudge, in the expectation that your new posts will also lead to quality engagement. This is one of the reasons why influencer marketing can still succeed on Instagram. Influencers have a history of making highly engaging posts that perform well. The Instagram algorithm notices this and rewards influencers by ranking their future posts higher in people's’ feeds. Instagram also rewards people who can bring about quick engagement. 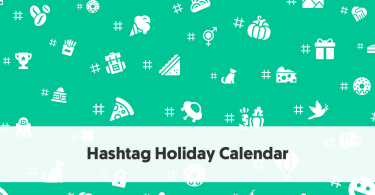 If an influencer uses popular hashtags, resulting in quick engagement on a post, Instagram knows to send that post to more people than it otherwise would. Instagram takes notice of how long people spend viewing your post. If Instagram notices that people spend more time than average interacting with your posts, it will boost your post in front of more people. This gives a real incentive to spend time crafting compelling captions. It’s one thing to take a quick look at a photo, even a compelling one. But it takes longer to read a quality caption, and then consider adding a comment. You really want people to be interested enough in your caption for them to click the More button, which adds to the time they spend on your post. The most significant change in 2016, which still applies, is that Instagram now gives favor to posts made by accounts they consider “friends and family.” This has been a real problem for businesses who have struggled to gain traction with company posts. The more often that you engage with somebody's content, the more Instagram feels that you like that person's content, and the higher priority they give to posts from that person in your feed. TechCrunch reports that “Instagram relies on machine learning based on your past behavior to create a unique feed for everyone. Even if you follow the exact same accounts as someone else, you’ll get a personalized feed based on how you interact with those accounts.” This means that if the Instagram algorithm is working correctly, you will see more posts from the people you love at the top of your feed, and less from accounts you don’t care about. While influencers are not usually real-life friends and family, they typically build sufficient reputation and trust with their followers, that they appear like friends, as far as Instagram is concerned. The best business accounts, such as Red Bull, do the same. Over time the Instagram algorithm is smart at building up a picture of a user’s interests. Instagram will notice if you regularly share cat pictures. Likewise, they will take note if most of the posts you like and share are about fishing or boating. Instagram tries to show each user what they want to see. This means that the Instagram AI gives priority to posts on topics that it believes will most interest each user. Again, influencers can use this to their advantage. If they specialize in making posts about a particular subject, it means that their posts will appear more regularly in the feeds of people who have shown an interest in that specific topic. So people who often share photos showing fishing spots are likely to be shown posts about fishing that influencers make on that topic. Note that although the topic of your content affects the likelihood of a post being placed in a feed, the format of the post doesn’t. There is no longer any advantage given to posts featuring videos, over those with static photos. Of course, if somebody interacts more with videos than they do with static images, they will be fed more video posts in the future. The same will apply in reverse. Similarly, Instagram doesn't reward people just because they use Instagram Stories, Instagram Live, or IGTV. Use of these features will not affect how Instagram treats your traditional posts. All of the above factors are still significant. However, they initially led to the promotion of old posts, and people began to question how good the algorithm was at selecting relevant content. Instagram now recognizes that people do prefer to see relatively fresh material. Sure they want relevant content from the people they trust. But they really prefer to look at current posts, not ones that were made days ago, which now feel stale. The time of posting is now more critical than it was for the last two years. The previous system showed an obvious flaw when it was still feeding out Christmas posts long after the festive season. We will hopefully not see a repeat of that this coming holiday period. This means that you need to take more notice than ever of when your target audience is active. Ideally, you should time your Instagram posts for just before your best followers come online. 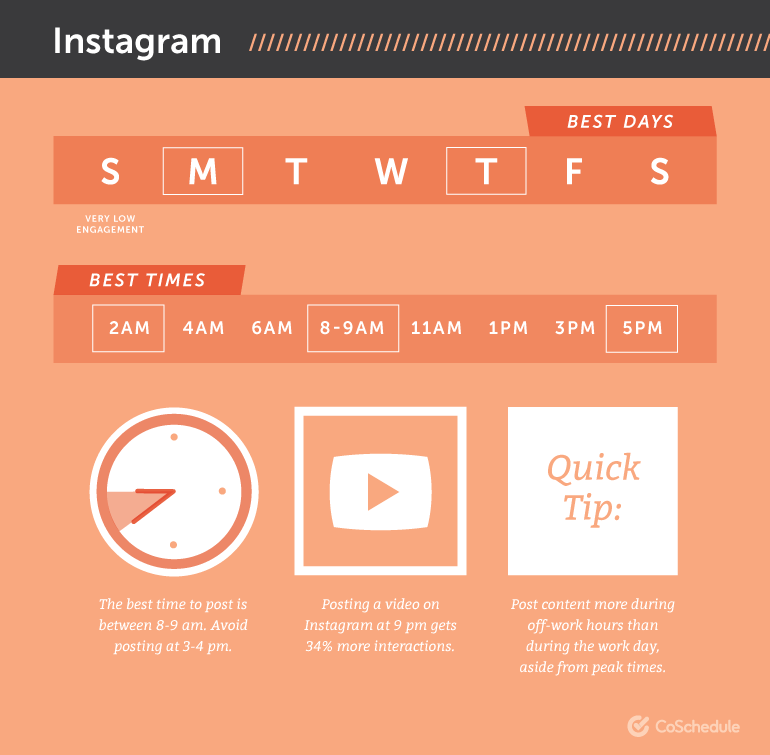 CoSchedule collated 23 studies on the best times to post on social media. 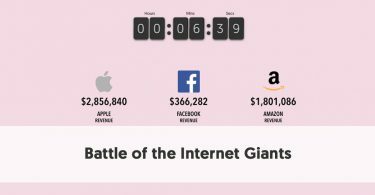 They conclude that while each of the social networks has peak posting times, they vary between the networks. Obviously, this will differ for any particular audience. With regards to Instagram, CoSchedule found that audiences are most engaged throughout the working week. The best times to post are 8-9am, 2am, and 5pm. They found that the most significant time to avoid is between 3 and 4 pm. The finding that posts made at 2am are popular is quite a surprise. Apparently, most people engage on Instagram outside work hours, but not at the weekend. However, every audience will be different. Take a look at the analytics for your account to see when your followers are most active. 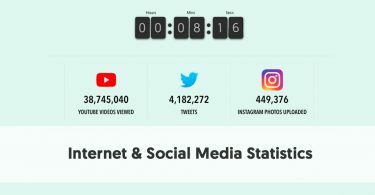 Of course, most businesses are not so dedicated to their social media that they will be sitting up at 2am to make posts. This is an excellent reason to use a Social Media Posting / Scheduling Tool to help you make your posts. Whether somebody has upgraded to a business profile or not does not have a direct impact on where their posts appear high in an individual user’s newsfeed. It all comes down to the relationship between an Instagrammer and his/her followers (along with the other factors referred to above). Somebody with a business profile who shares a post with a follower they regularly engage with is just as likely for their post to be seen, as somebody with a personal profile and the same relationship with the follower. Despite rumors that Instagram suppresses posts from accounts with business profiles, presumably to encourage advertising, there is no evidence that it is a factor in the Instagram algorithm.